This year it has been a long summer and we waited for the temperature to plunge lower to comfortable levels for a very long time but the winter kept evading us. Almost the whole of October passed and we still waited for the first nip in the air and a sip of adrak wali chai or a nice Tulsi infused tea. I did enjoy my Ginger chai and Tulsi infused Darjeeling sometimes but the warmth of the tea was not as much comforting as it usually is during October, we even had our iced teas many a times this month. Thankfully last week has been a pleasant change and chai has become a bit more pleasurable. Just a little bit because winter still seems to be shy. You know I love my chai and the orthodox teas a lot. I will talk about ginger chai (adrak wali chai) later, let's talk about the orthodox teas for now. Orthodox tea is just tea, water at the right temperature suited for you, the right brewing time and nothing else. But there a lot brewing between these parameters of right temperature and the right brewing time, the cup of tea that you hold in your hands after brewing it correctly is a comfort few things can bring. And yes you need to know what tea suits your temperament and requirement. Or if you need a tea and herb infusion for you. Green tea and Lavender or some rose too? Or a hint of Chamomile and Lemon balm? Hint of Peaches in your tea? What about Rooibos orange? I keep meeting many tea enthusiasts and all of them seem to be choosing their herbs carefully to infuse into their teas. There seems to be a magical connection between the personalities and the herbs and the way they chose their herb infused teas, how they brew it and then take a deep breath while sipping, eyes closed almost always. One gets completely drawn into the moment when the fresh brew brings a sense of calm, the first sip of a well made tea is magical. 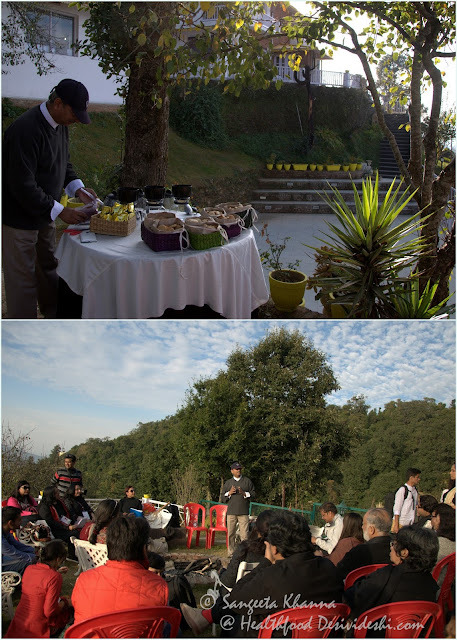 I had been thinking and planning more around teas as few months ago I was asked to curate a tea and poetry session for the recently concluded Kumaon Literature Festival (KLF). 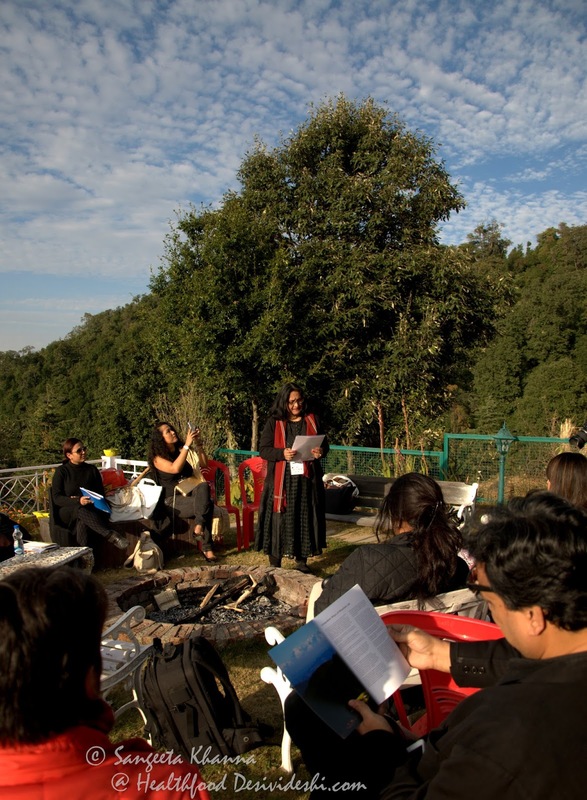 This tea and poetry session was planned to be held in the oak forest, a small climb up the Te Aroha, venue of the KLF and we wanted some discussions on teas, their connect with literature and poetry and poetry recital by some eminent poets. The idea of teas and poetry in the Oak forest kept us warm when we were planning the nitty-gritty of this event. I have known Mr Vikram Mittal for some time and recognize him as one of the most knowledgeable people regarding teas. So he was roped in to make us all experience great teas in a rustic set up along with poetry being recited in good measure. We had planned a few cookies and trail mix pairing with the teas too, and since it was an outdoor rustic setting we chose to serve the cookies and trail mixes in reed baskets I sourced from Manipur Emporium. 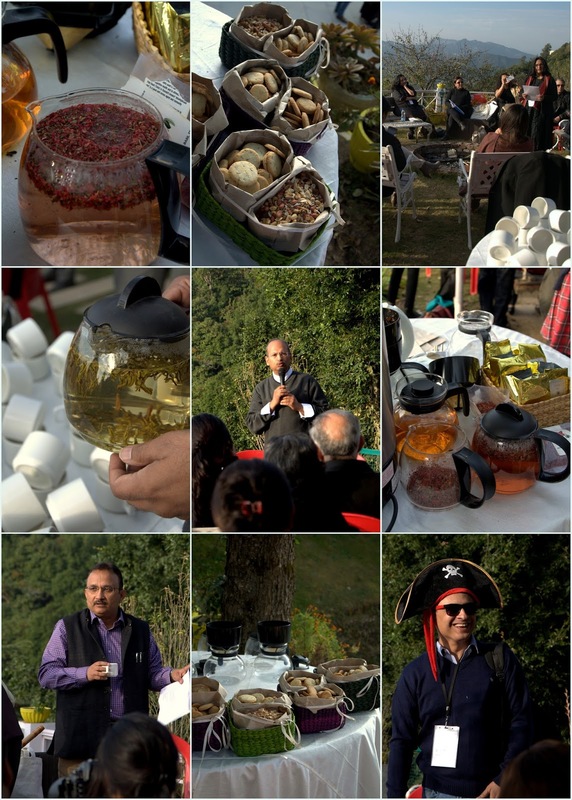 Here is Mr. Mittal arranging the teas to be served that day and explaining about the teas. We served seven types of teas and each tea was brewed several times over. Everyone loved the teas much to our pleasure. In the last moment we decided to do this tea and poetry session around the camp fire place at Te Aroha and not in the Oak forest as many poets did not want to hike to the forest. Ms Abha Ayengar moderated the poetry reading and Mr Mittal kept introducing teas in between, the venue was swamped with tea and poetry lovers and I was the one who ended up brewing loads of teas one after the other. It was a wonderful sunset after a beautiful cloud formation in the sky. A classic Cirrocumulus stratiformis type of cloud that turned golden as the sun set, I was brewing teas of all hues at that time and kept craving for a break to click a picture. 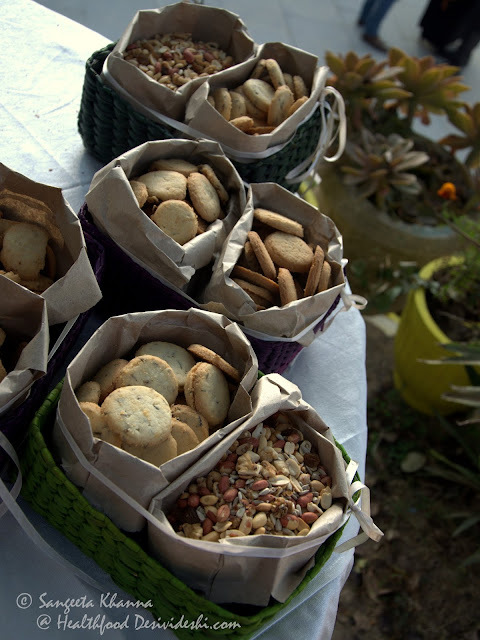 Here is the rustic arrangement of cookies, Lavender and lime, candied orange cookies, ginger cookies and a trail mix, everything just vanished within a span of about 40 minutes. 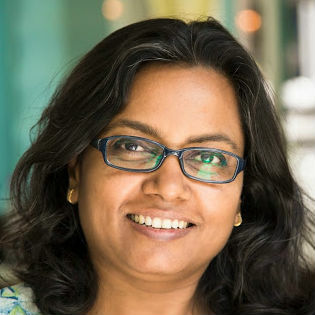 The cookies were baked by Shikha Sachdev who runs Cocoka, the recipes were mine. I had done the trail mixes myself. We had initially planned for a quite systematic serving of teas and snacks but it got so crowded that we decided to set up 3 such snack stations. 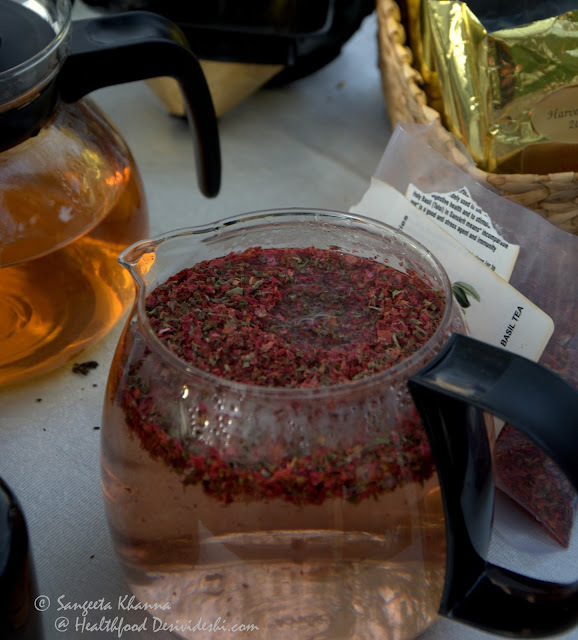 The most popular tea of the day was Rhododendron and Holy basil infusion. 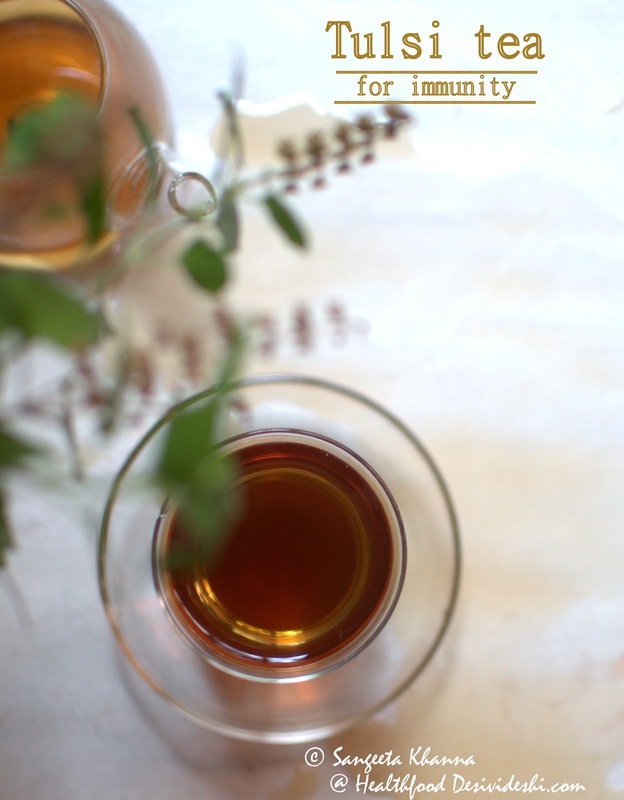 We had blended two types of Holy basil in this one and the result was no less than magic. I had to brew this one several times over. The second most popular blend was Earl Grey floral, so aromatic and warming that most people took second and third helpings. It was a cold evening in the mountains and tea helped in the outdoors. Kahva was also liked a lot with it's mild spiced notes suited for the weather. Come winter I depend a lot on Kahva as well. I love the way Kashmiris have come up with a blend of cinnamon and green cardamom along with a hint of saffron. I generally let a bruised almond boil with the water before brewing tea for Kahva (Quahva) but he Kahmiris sprinkle coarse powder of almonds to their Kahva. Our all time favourite is Darjeeling. Without milk mostly but sometime with a dash of milk too. Now the good thing is that Mittal Teas is giving away two (2) gift packs of a personalised selection of teas to the readers of this blog. All you have to do is tell us about your favourite herbs and spices, add some flowers too to the list and we will decide what teas you would like. We will choose 2 reader comments on this post so start commenting if you love good quality teas. I am sure we will be able to find a couple of tea blends you appreciate. 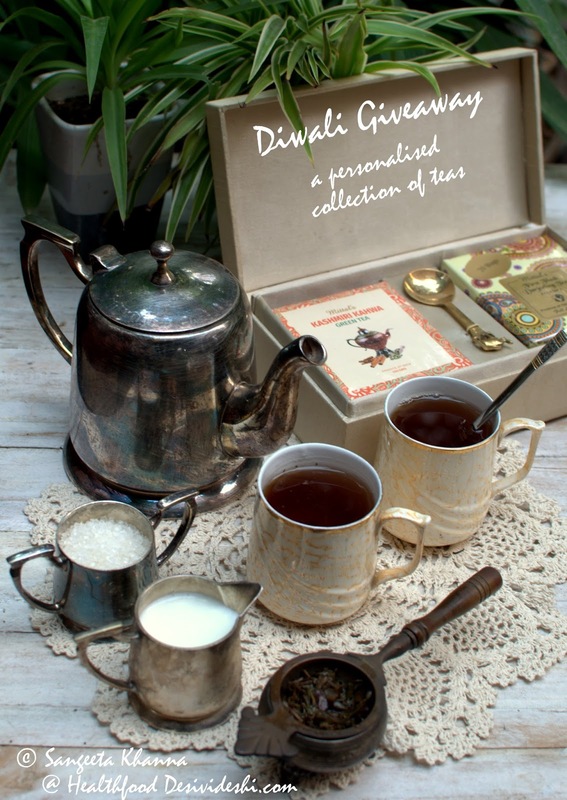 You need to have an Indian address to win this Diwali Giveaway of a personalised tea hamper. So tell me about you favourite flowers, spices and herbs and enter a chance to win this give away. Recently tried out Hibiscus tea with cinnamon and lemon grass. which was shown in the Master Chef extra class by Chef Sanjeev Kapoor. I prefer cinnamon, ginger and lemon grass flavours the best with a little bit of honey for the sweetness. Lovely photographs and nice post !! I am huge chai fan and have been doing a series called 'The Great Indian Chai Experience' on blog. This series shares chai experiences from different parts of India. Because Vibha likes experimenting with different types of tea, now I have started enjoying Tulsi tea. Apart from that I like rose tea during the evenings or when it's served in her writer circle events :) . I cut my teeth on premium Darjeeling tea gifted by my uncle who used to be manager of a tea estate. Since then I have had periods when I used to have milk infused cardamom tea, tulsi - ginger tea and then finally back to Darjeeling tea. After insistence of doc I gave up milk in my tea so now it is Darjeeling with just few grains of sugar to cut through the astringent flavour that creeps in if it has been seeped for a tad long. Someone had gifted some mixes of fruit and flower based tea bags. They were brilliant - orange, blueberry, hibiscus and more. They were called teas but had no tea leaves in them. I keep searching for Indian version of it but have not been able to find them. The nearest version I have seen is, of all things, 'Divya pey' marketed by Baba Ramdev! It is a heady mix of spices that also helps in keeping you warm. During one of the program when we were not supposed to have any caffeine, I had prepared a powder of cinnamon, cardamom, black pepper and fennel seeds. Add a pinch to hot cup of water, a dash of honey or sugar and it was a soothing hot drink in winters. But yeah, would love to have access to loose flower/fruit based tea mixture available in Delhi. Am not a big fan of tea bags :). Btw, I love the tea strainer in the pcitures! I love tulsi tea and hibiscus tea too much. Ginger with elachi is my all time favorite daily I consume . Up in the slopes of Sikkim, they grow Temi tea. Tea is mellowed by harshness, and Sikkim provides that in plenty. 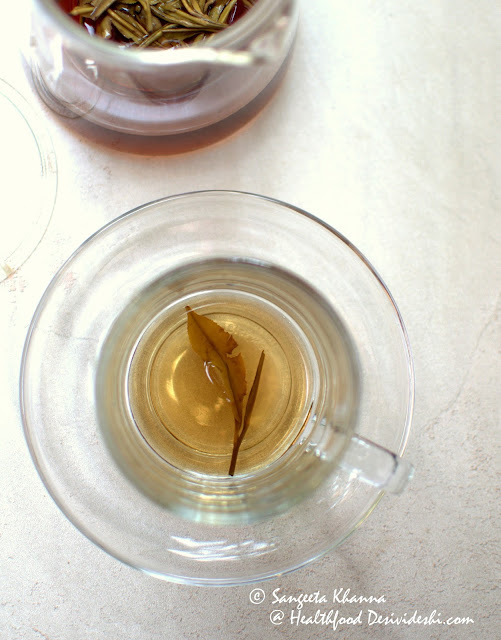 An immensely forgiving leaf, Temi will give you flavour without the acidity even if you accidentally overbrew it a little, or are eager and serve it too soon. Temi is for late afternoons. 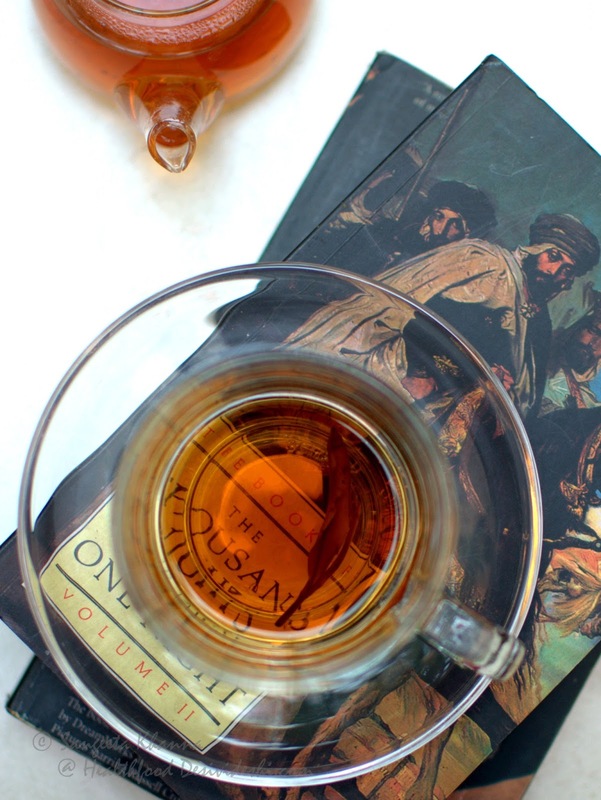 Early evenings, I prefer tea of dried sage flowers. It is not an easy tea to find -- in India the purple variety of sage is very rare. But if you do ever come across it, buy it without a thought. The delicately sweet flavours are a perfect forerunner to a an elegant dinner. I love earl grey,peach black tea, green tea with mint etc. My absolute and utter favourites: lemongrass tea and the original.masala chai sweetened with condensed milk with Adrak, laung, elaichi, dalchini and my surprise ingredient: Powdered javitri. Gives it a warm sweet spicy aroma! Sangeets, this is one of your most beautiful posts. I missed the fest but I must thank Arvind and you for introducing me to Mr. Mittal. This post reminded me that I need to go to their outlet soon. I love lemongrass tea a lot apart fro mthe usual Darjeeling Tea without milk. Sometimes in winter I chuck my fav coffee for a tea made with ginger, clove, peppercorn, holy basil, anise and a little of cinnamon. The spices and herbs are relaxing and give warmth in harsh winter. Apni desi chai with lotsa sugar milk to hai hi but very rare with me. Another fav is Flowery Ballad from L'Opera. The fragrance of rose and simple spices in this is out of the world. Himalayan brew we picked up during one of our travels. It is a Kagra orange pekoe tea. Mild and flavorful. I love kahwa and take chamomile esp during period cramps. (Y) that reminds me my MIL used to five caraway and fennel tea to me during this time. She used dill seeds (soova or sowa) from their village in himachal. strong flavor but good. Called it pahadi saunf. I think its dill. I always wonder if night jasmin or harshringar could be infused as tea and will it have the same lingring aroma that the flower has? same with lemon and orange zest or dry peals or their blossoms too? How about using apple cider or fruits like cherries or other berries? Dont know if the yare fit for tisane but I enjoy the idea. Also the use of nuts like walnut, pecan or hazel nut or maybe the seeds liek majaz or chilgoza wit hrose hips/petals? I know it is sacrilege and I am going overboard with this but please excuse ..poets ke sath hota hai :p A black tea with a infusion of cocoa or chacolate or maybe caramel in latte? The idea came when I caramalised and poached peaches in a tea decoction (used the Flower Ballad for this one) The sauce had this distiguished taste of tea with a mild caramel touch. I found that tingling on my tongue. Now, I am yearning for some so thank you for this conversation here. Look forward to your special combinations. adrak, with a dash of saffron with some water and milk brewed with tea leaves, that's the kind of tea I have grown up with and I still make. Nowadays occasionally a green tea or tulsi ginger tea from organic India is being made. 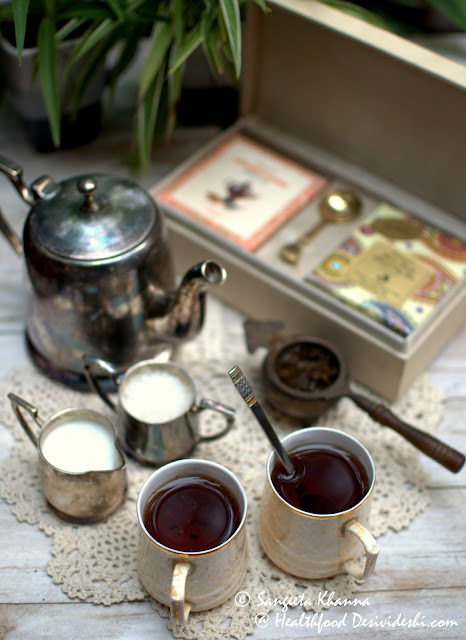 Tea time and gupshups are always good.wonderful post. warm tea with greentea leaves with 'mint basil' and crushed ginger. the variation i make is, instead of 'mint basil' i use galangal leaves or lemongrass or cardamom. i make lots of this tea and refrigerate it. its extremely refreshing to have this cool tea. Hi Asmita, I also poach apricots in spiced tea (rose, green cardamom, chamillia Sinensis and cinnamon) infusion. I find they get a little mushy but taste very good. Make a brew and strain. In a pan add this brew and honey. Bring to boil and lower the heat place pitted apricot halves. Skin side down. Brew should be just enough to cover the apricots. Within a few min the fruit will soften a little. Take the fruit out on a plate carefully. It should be firm. Not mushy. Reduce the liquid a little. Don't overdo or it will become jelly like when cool. Pour some of it on the fruit with a spoon. When you serve, layer ice cream n fruit and spoon the tea sauce over it. Top up with good amount of apricots n again pour the sauce. It should be the right consistency. Not too thick. Not to liquidy. Enjoy! Sounds brilliant and thanks for the tips. I don't like heating honey as I've heard that it kills it's property so will use some other sweetner. But other than that it sounds utterly delicious. Without my morning tea is am totally lost, so to boost my energy, I prefer strong tea with tulsi, ginger and cardamom, cinnamon , afternoon tea would be Egyptian licorice mint tea.